Marsaxlokk fishing village has a working harbour, the boats still go out and catch fish to supply the local restaurants, shops and market stalls. 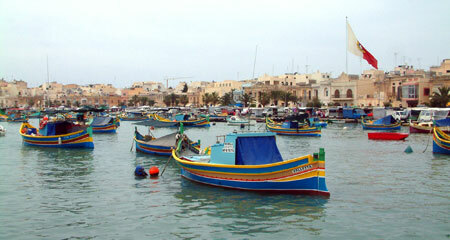 Many of the boats are painted in bright traditional colours and are known as Luzzu fishing boats. The Maltese take great pride in their boats. Some people come to shop and stay for a fish lunch at one of the local restaurants. 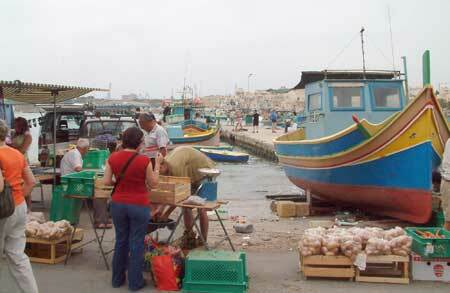 Marsaxlokk is a busy bustling place on a Sunday morning when the market is held. There are lots of tourists browsing the stalls, taking photographs, drinking coffee at the pavement cafes.